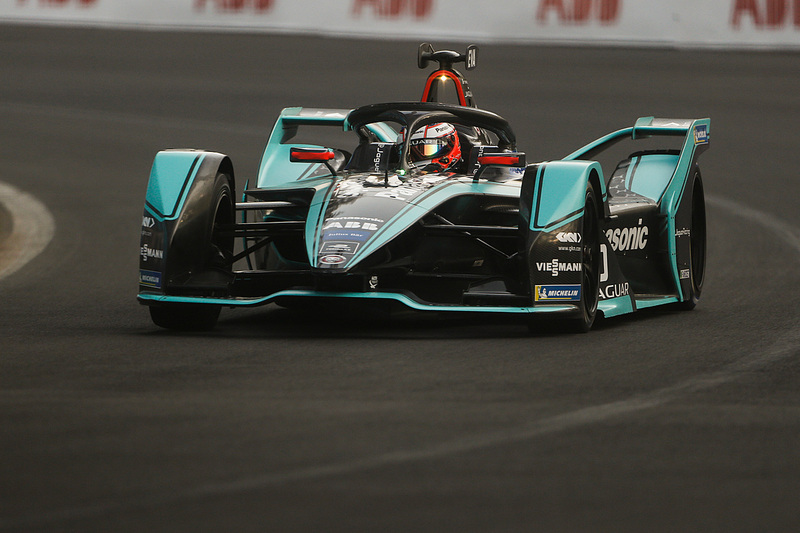 Mitch Evans has taken his and Panasonic Jaguar Racing’s first ever Formula E victory following a titanic race-long battle with the DS Techeetah of Andre Lotterer, while Stoffel Vandoorne put in a stellar drive to take his maiden podium. The race got underway in wet conditions following heavy rain after qualifying, which made conditions on the opening laps tricky for the 22 drivers. Andre Lotterer kept his lead from Mitch Evans off the line, but Stoffel Vandoorne made the best start as he jumped the GEOX Dragon of Jose Maria Lopez. GEOX Dragon’s misery was compounded further as Maximilian Günther went for a spin at turn four, breaking his front wing on the barrier, while BMW i Andretti’s Alexander Sims endured more misery himself as he went into the barriers on the opening lap, breaking his front wing..
Also on the opening lap, Bird was punted from behind by Lopez at the chicane or turns 11 and 12 and damaged his car on the barrier, potentially ending his race. The red flag was then called upon for the fourth successive race following a pile up at turn 19, which was caused by Lopez getting out of shape through the chicane and hitting the wall, with Gary Paffett hitting the back of the GEOX Dragon behind being rear-ended himself by the DS Techeetah of Jean-Eric Vergne. The suspension offered some reprieve for a few drivers, with Sims, Günther and Vergne able to have their cars repaired while the Envision Virgin Racing mechanics worked tirelessly on the rear left suspension of Bird’s car, eventually pulling off a seemless repair job and enabling Bird to rejoin the race. The only retirement as a result of the chaos was the HWA Racelab of Paffett, who suffered diffuser damage from Vergne hitting him in the rear. During the red flag period, the FanBoost winners were announced, with the extra surge of energy going to Vandoorne, Antonio Felix da Costa, Daniel Abt, Sebastien Buemi and Lucas di Grassi. With the stricken cars cleared away and the order sorted, the race resumed about 45 minutes later behind the safety car with Lotterer leading Evans and Vandoorne. Multiple drivers went to activate their attack mode before the safety car came in, with the top four electing to wait until later. Robin Frijns was the first of the drivers to use attack mode and harassed Buemi for fourth place but the season two champion held firm and denied his Dutch rival, in the process allowing Oliver Rowland to close in and attack Frijns. At the front, Evans got to work on closing down Lotterer in front of him, while Vandoorne behind activated his attack mode and put it to use in his pursuit of the race lead, but was unable to make a pass on Evans in front of him. Further down the order, Abt made a mistake at turn 14 and found himself facing the barrier, but luckily for the German he sustained no damage and was able to continue. The Venturi of Edoardo Mortara was then forced into retirement after slowing due to a technical issue. It soon became double-trouble for the Monegasque team as Felipe Massa also pulled to the side of the track with gremlins plaguing the car. 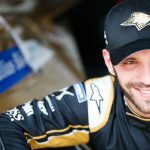 With 20 minutes to go Evans activated his first attack mode and set off after Lotterer, making a brave move on the German with only seconds left of his attack mode. The chicane of turns 11 and 12 isn’t an apparent overtaking spot, but the Kiwi somehow made it work and moved into first place. Lotterer activated his attack mode straight after and work on getting the lead back, with Vandoorne still in tow behind the leading duo. Despite his best attempts, Lotterer was unable to make the move with his attack mode as they both entered the last ten minutes of the race with one activation left each. Further down the field, there was a battle between the championship contenders as di Grassi, da Costa and Jerome d’Ambrosio all fought for the same piece of tarmac with the final points paying positions on offer. Back at the front, Lotterer took his second attack mode and went after Evans, with the Kiwi attempting to activate his two laps later but missing the final activation point. Lotterer took the opportunity to close in and apply pressure, but Evans stood firm and kept the DS Techeetah behind him. When he activated his second usage the battery levels were getting dangerously low and questions were raised as to whether they would reach the finish. Evans started the last lap with 5% and Lotterer 4%, with the battle apparently called off as they both looked to reach the end of the race. 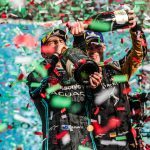 With Lotterer ending his pursuit, Evans cross the line with 1% left to take his and Panasonic Jaguar Racing’s first ever victory in Formula E after an enthralling battle with Lotterer, while Vandoorne completed a superb but anonymous race to take his and HWA Racelab’s first ever podium in the series. Frijns came home in fourth place ahead of the Nissan e.dams duo of Buemi and Rowland, while championship contenders di Grassi, d’Ambrosio and da Costa all finished in the points ahead of Pascal Wehrlein who rounded out the top ten.